•Occupational change as a result of technology adoption is slow, but inevitable. •Automating routine tasks can be both beneficial for businesses, through cost reduction, and workers, by reducing mundane tasks.  •Technology adoption means the jobs of the future will require greater skills and more training. One way to determine if a job is automatable is to ask if the tasks completed are routine or non-routine. Routine tasks are repetitive, predictable, and can be accomplished following explicit well understood rules. For example, packagers use their hands to package products and materials. This is a task that is repetitive, predictable, and requires the packager to follow explicit rules to complete i.e. following weight guidelines for the box, ensure packing specifications are met, and recording information on the package, etc. Because of the nature of routine tasks, technology can easily substitute for human labor in these professions. Bank Teller jobs are considered to be routine-cognitive meaning they primarily involve using thinking skills, but the tasks of the job are repetitive. Bank telling as a profession is considered to be highly automatable. On the other hand, non-routine tasks are comprised of problem-solving, creative thinking, analysis, situational adaptability, and in-person interactions. While routine tasks are likely to be replaced by technology, non-routine tasks are complemented by technology. For example, statistical processing software makes it easier for scientists to analyze the results of their experiments. Digital medical records make it easier for doctors to diagnose their patients. Because non-routine tasks require strong critical thinking, finding new solutions to issues, and emotional intelligence, it is much more difficult for machines and computers to replace these tasks. Following WWII. 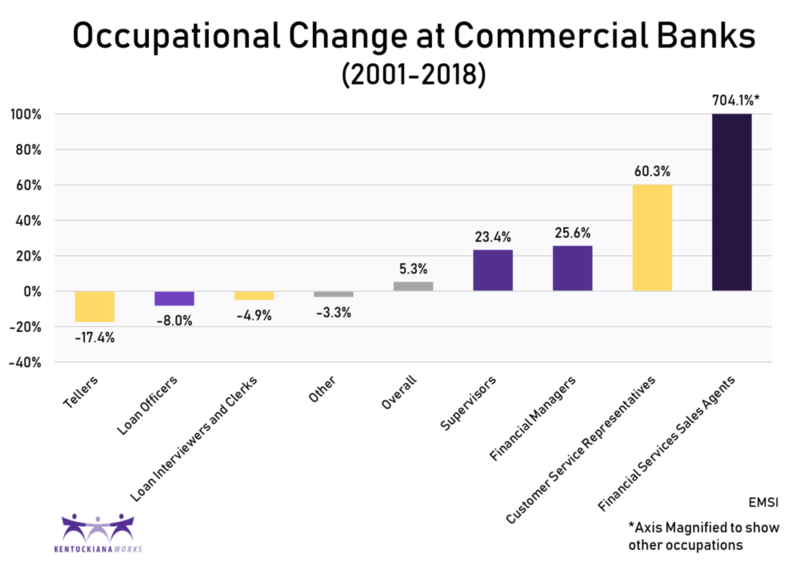 there was an increased demand for banking services from the general public. As a result, banks needed to increase their staff, including bank tellers. For women with little education or clerical training working as a teller provided an avenue into the middle class. As the number of bank customers multiplied, bank tellers began performing routine transactions for a large number of customers. This included cashing checks, depositing money, and answering questions from customers about their accounts. The first ATMs were introduced into commercial banks in the 1960’s and became ubiquitous in most banks by the 1990’s. Like tellers, they could accept checks and cash for deposit, display account information, and issue cash. The introduction of ATMs did not immediately reduce the need to hire bank tellers. 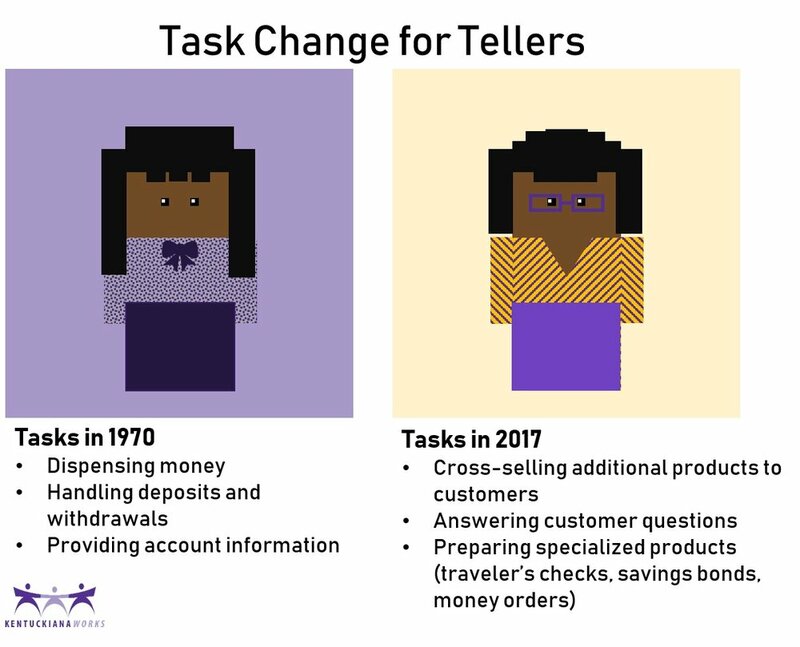 While technology served as a substitute for the tasks of the bank teller, it did not totally lead to the total elimination of bank teller jobs . One reason for this was the automation provided by the ATM allowed banks to operate more efficiently. As a result, more branches were opened. These branches were staffed with fewer tellers per bank branch. Overall, this was good for the economy as a whole because more people had access to banking services. 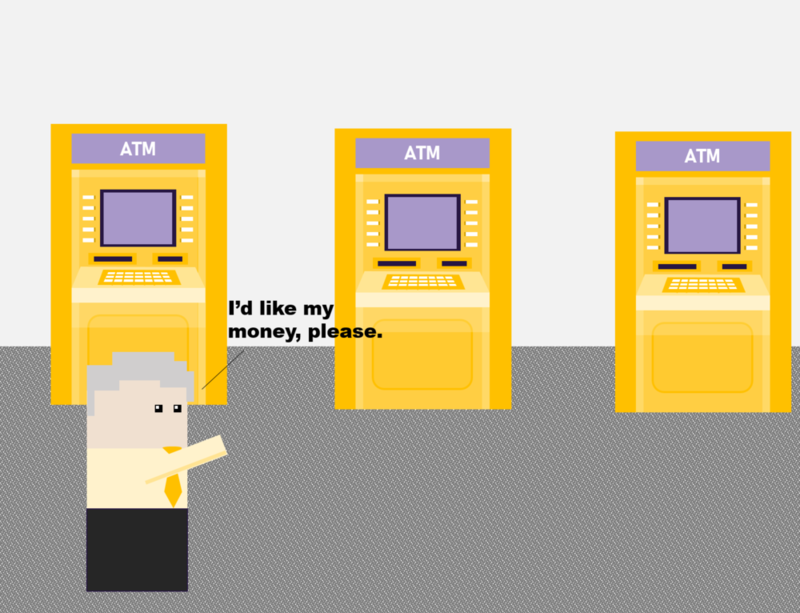 Today about 60% of bank teller duties can be done by ATMs. As ATM technology becomes more sophisticated, in the next 20 years up to 90% of bank teller’s original duties are expected to be automated by ATMs. As ATMs have relieved bank tellers from many of their routine tasks, the job duties of bank tellers have changed. Today’s bank tellers need more customer service and sales training than they did in the past. As a result of automation, more education is needed for bank teller jobs. This is also known as “skill-biased technological change.” As technology replaces routine tasks, the tasks left for people to complete are more complex and require more training and education to accomplish. For routine-cognitive jobs like bank telling, recessions in the economy accelerate the demand for more education, skills, and experience. 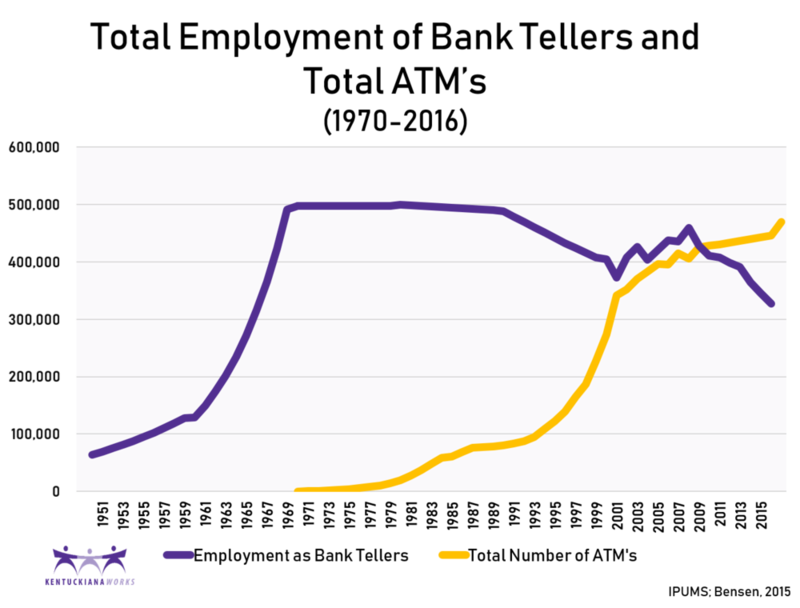 As a proportion of commercial bank employment, bank tellers have decreased. However, overall employment at commercial banks has increased. Technology has changed the services the bank needs to offer and the training the staff requires to perform the functions of the bank. 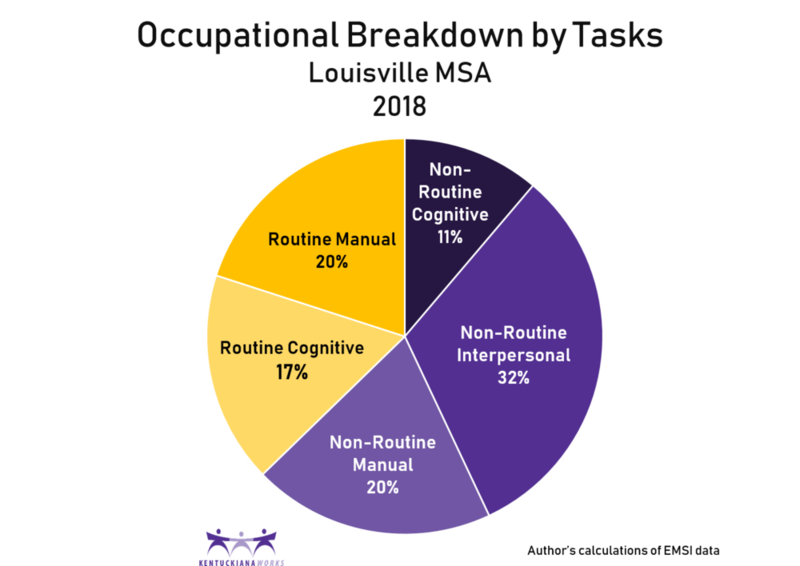 In Louisville, 37% of all jobs are routine, meaning the majority of tasks in that occupation are predictable, repetitive, and easily accomplished following explicit rules.  Routine-cognitive jobs like bank tellers comprise 17% of jobs in Louisville. These jobs are at a high risk of automation. 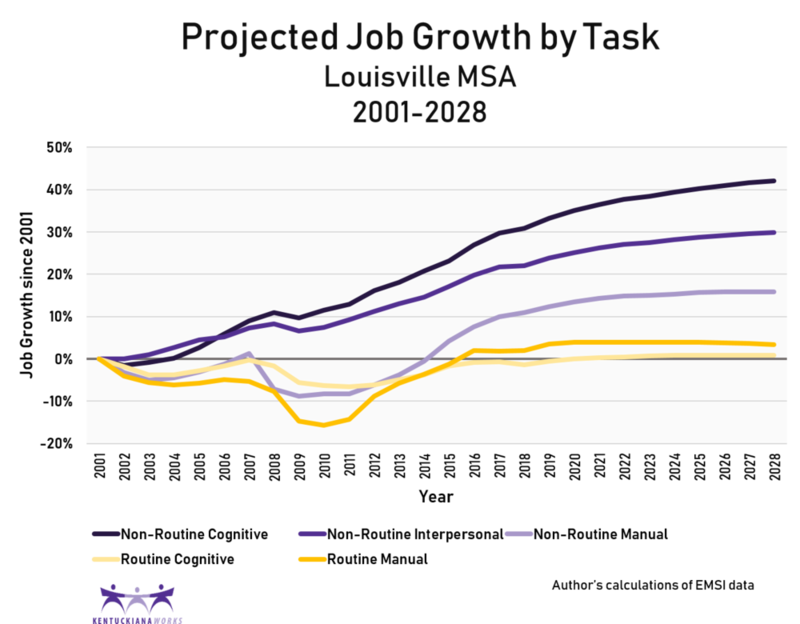 Over the past 20 years, job growth in Louisville has primarily been in the form of non-routine work. Routine jobs have grown at a much lower rate. This includes bank tellers. •Routine jobs are not predicted to show strong growth. Many of their tasks are likely to be automated. •In the transition to automation, jobs will see their tasks and duties change. 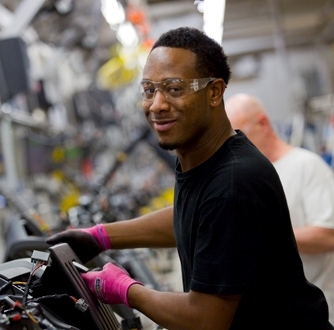 This will require workers to be flexible and able to adapt to new technologies. •As the tasks of jobs change, workers will need new skills in order to perform these functions.